Army Man Behind The Viral Kerala Floods Video: Is He An ‘Imposter’? A man whose video in uniform was called an imposter by the Indian army is an ex-serviceman and working with the Defence Security Corps in Tamil Nadu. Unni S Nair, an 18-year old veteran of the Indian army and now with the DSC had posted a video on Saturday expressing his anger against Kerala Chief Minister Pinarayi Vijayan for failing to give complete control to the army in the flood rescue operations. 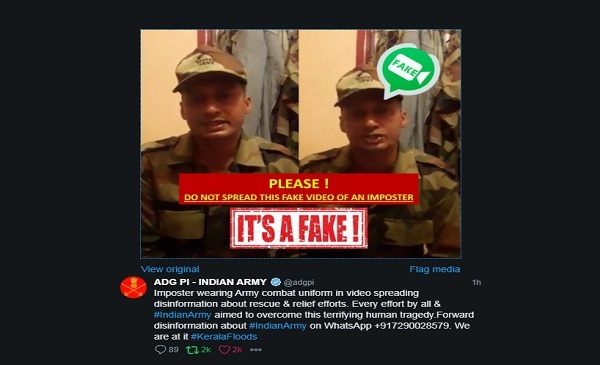 The army responded swiftly on Twitter calling Nair an imposter and the video fake. The video was watched over 4,37,000 times and shared over 27,000 times at the time of writing this story. The video has now been taken down. Unfortunately for Unni Nair, his video also coincided with another audio that went viral on WhatsApp, asking people to donate goods to Sewa Bharti, the RSS relief wing. The audio recorded by Suresh Kochattil, who describes himself as part of the social media wing of the BJP angered many on social media as Kochattil called majority of the victims of the Kerala floods as ‘rich’ and hence did not require food. He said that the flood victims need electricians, plumbers and other technicians to clean and rebuild their houses. It is important to note that Nair did not ask anyone to either re-direct their relief material to any particular organisation or communalise the rescue efforts as done by other Twitter handles and Facebook posts. Nair’s only request was to give the army total freedom without any restriction, as perceived by several flood affected victims in Kerala. But it appears that several Twitter handles who were already upset about tweets, audio and video messages seeking to politicise and communalise the Kerala relief floods directed their anger against Nair. India Today anchor Shiv Aroor called Nair a ‘fake’, also pointing out to the audio/video that had gone viral. But Aroor later differentiated between the audio and the video message but called Nair an ‘imposter’. So is Unni Nair an imposter? BOOM spoke to friends and relatives of Nair who clarified that he is an ex-serviceman but currently working with the Defence Security Corps. The DSC is a wing of the Army and its personnel subjected to the Army Act. The Corps is a Security Force maintained and organised on the Army model and its role is to protect Defence units/installations. Sources in the family point out that Nair recorded the video out of emotion as he had immediate family and friends stuck in the floods in Pathannamthitta district in the state. When he came back from work on Saturday, he saw the Chengannur MLA Saji Cheriyan pleading for help and shot the video in an emotional outburst. He has now been directed by his superiors to keep away from social media. Nair’s in-laws and other friends were stuck in Nellikala, Pathanamthitta district and he was remotely working to locate them. Sources say he regrets recording the video in uniform but his intention was never to misuse his army credentials to invoke anger against the government. BOOM spoke to an army spokesperson who said that he will crosscheck Nair’s credentials but even if his claims of being a DSC soldier is true, he cannot record social media messages, especially in uniform. The spokesperson clarified that their tweet called him an imposter based on his video in uniform, which serving professionals are not allowed under the Army act. Nair is not alone in the debate that has raged in Kerala about the role of the army in the rescue efforts. The opposition led by Congress leader Ramesh Chennithala had requested the government to give the army greater autonomy to conduct relief operations. Currently, the army can only work in co-operation with the local district authorities that many argued led to delay in saving lives. This had led to CPM state secretary Kodiyeri Balakrishnan opposing the call for “total army deployment.” “The Opposition leader is calling for the Army to take over the state’s administration, which will not happen,” Kodiyeri said, according to this report. Chief Minister Vijayan had also responded to the charge by insisting that in all cases of disaster relief in the past in other states, the army had always assisted the civil administration. 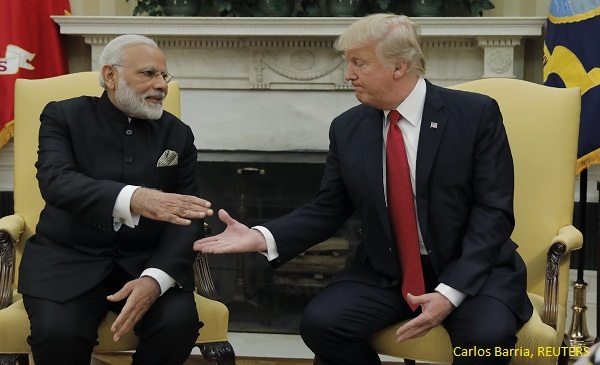 He pointed out the instances of the flood in Assam, Jammu and Kashmir and Tamil Nadu and the earthquakes in Gujarat.